Adele. The queen of Sicilian cooking and of caponata. 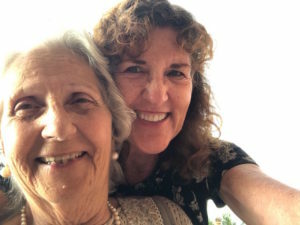 Roberto’s mom, Adele, was my cooking mentor the two weeks I spent in Sicily. 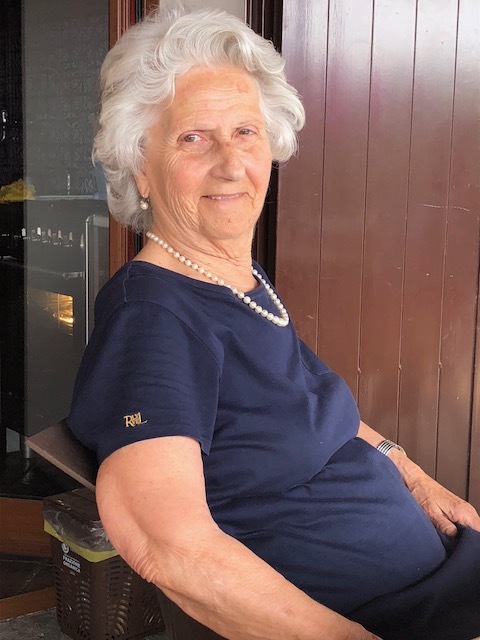 I watched as she prepared, mostly by memory, Pan di Spagna, quiche al formaggio, gnocchi, Insalata Russa (delectable potato, shrimp and carrot salad), risotto, frittata, brioche and caponata. Adele is the “nonna” (grandmother) of the family and queen of the kitchen. She is truly beautiful. 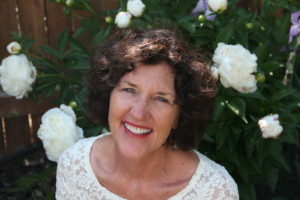 With soft brown eyes and a wry grin, she was rarely without perfectly quaffed hair, her pearl earrings and pearl necklace. Her elegance is the epitome of a classy, sophisticated Italian woman. How I wish I could absorb just a bit of her style and class. Cooking together in her narrow and efficient kitchen, I observed her graceful flow. Adele was focused, almost serious about her cooking. I admired her relaxed style and could always feel the love she put into every dish. Eager to show me one of her treasures, her tiny frame reached up high to a book shelf, her fingers pulling at the binding to release a book that gently fell into her hands. It was a family cookbook of Sicilian specialities. Her father was well-known, in his circle of friends, for his culinary prowess and Adele naturally fell in line to share the same passion. 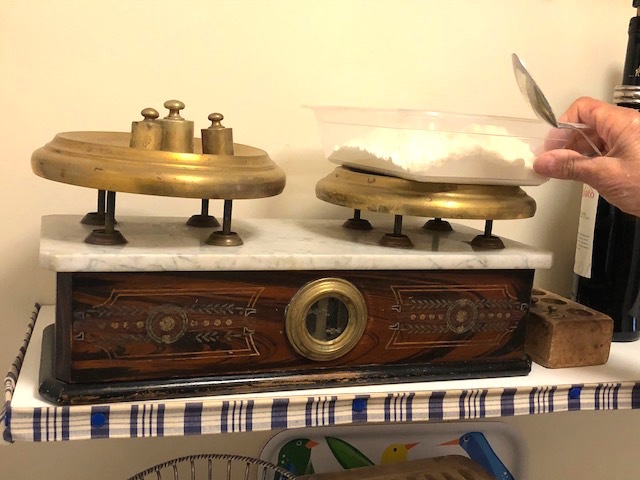 My favorite piece of equipment in Adele’s kitchen is an antique scale with gram and kilo weights for accurate measuring of recipes like brioche. One afternoon, we made caponata, a Sicilian summer classic, using the island’s abundance of fresh, local produce. Adele’s recipe and method appealed to me because it is baked in the oven instead of stirred on the stove, freeing up our time to prepare other dishes. 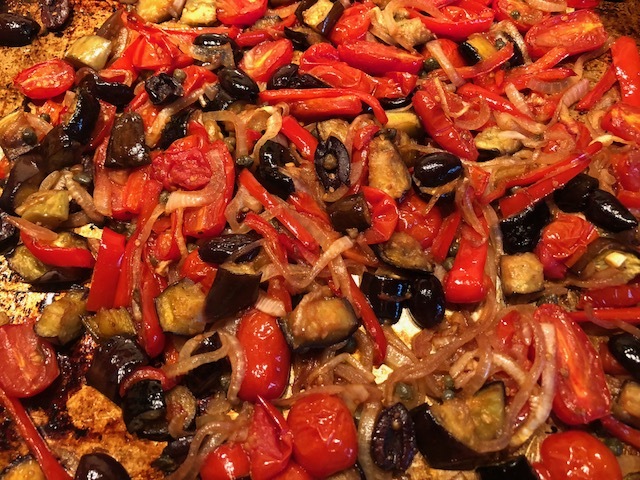 In Sicily, caponata is usually served cold, as a side dish or salad. It is also delicious as a topping for crostini. 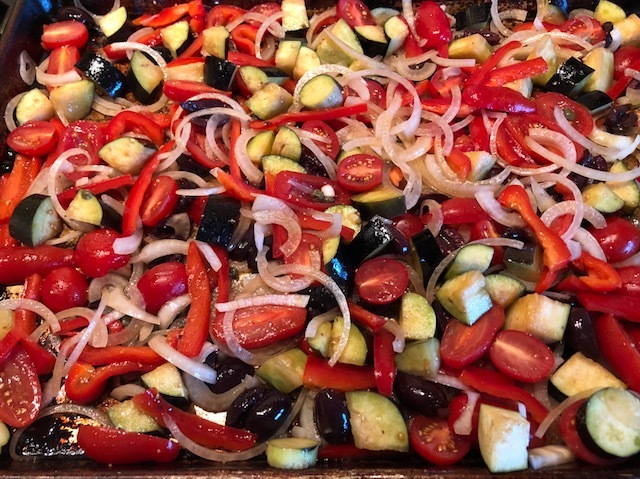 Caponata will last in the refrigerator 10 days so it can be prepared in advance. 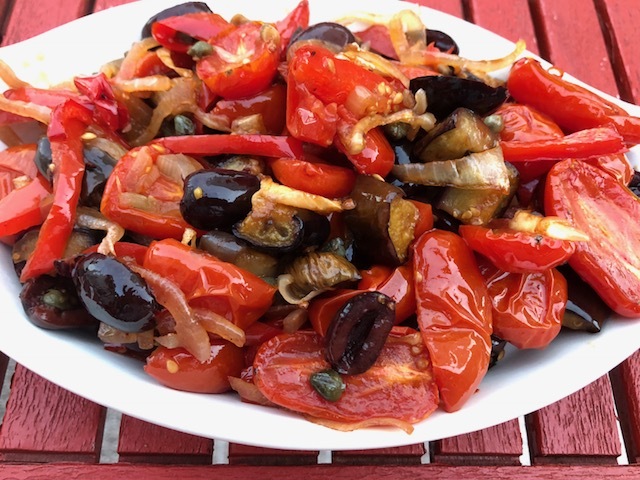 Caponata is a popular Sicilian dish found all over Sicily. This recipe is easy and delicious! Stir all ingredients together and arrange on a sheet pan. Bake in a 350 degree oven, stirring every 15 minutes until done. The veggies will be soft but still retain their shape - not mushy. 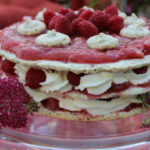 When I made this here in San Diego, it took 45 minutes and was absolutely delicious! Notes: The capers and olives add salt so wait to taste for salt until after the caponata is finished. I prefer to stir in the nuts after it has been cooked to retain their texture. Grazie Adele for sharing your kitchen, time and loving energy with me. We sure had a great time together!! Adele and me sharing a moment.